Readers, along with obsession with chocolate, I have a similar obsession with cheese. Hard cheese… soft cheese… cranberry inclusion cheese… white cheese… orange cheese… I’ll take any of them. Apart from pungent and mouldy. I’m unable to get my head around that. I know cheese is a little bit naughty and my post will probably have the Anti Fat Squad chasing me… but I love it. Especially when it comes in sauce format, accompanied by delicious macaroni spirals and to top it off, crispy pancetta. I have to confess, before meeting Mr WhatClaireBaked, I, 1. Very rarely ate macaroni. 2. Had no idea about the impact of adding pancetta to my recipe. Life changing. See, the thing with pancetta is that it adds depth to the dish. 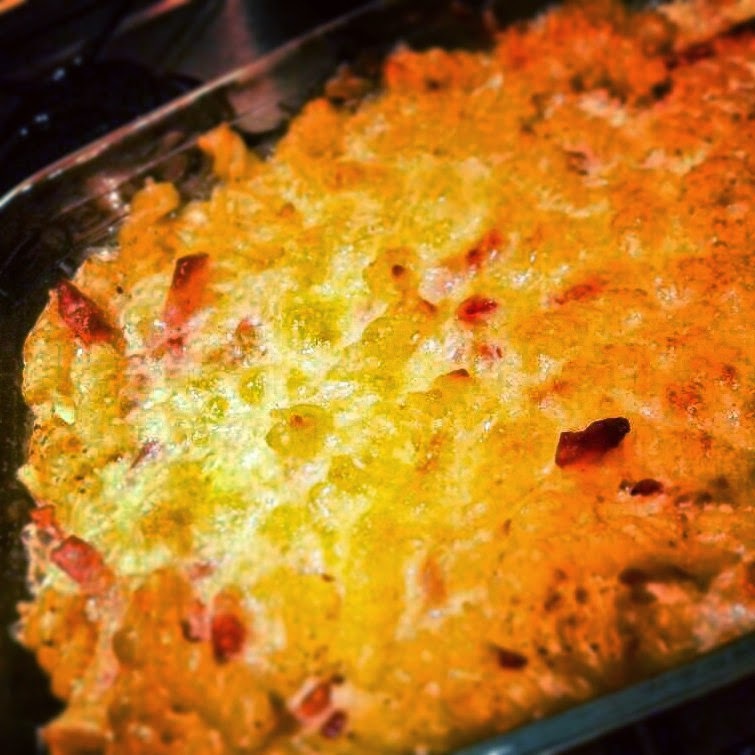 Those little crispy, salty, hammy squares add the crunch to the macaroni. In essence, macaroni could be baby food. But, throw in some pancetta, stick it under the grill and it’s almost entertaining-friends-worthy. Also, my mum once told me that if you can make a white sauce, you can make anything. I’m sure there’s an exact science to it, but so far, I’ve gone for the make a paste with butter and flour, chuck in some milk, keep whisking, boil, simmer and throw in the cheese method. To date, it’s worked. Yes, it’s carb-tastic. Yes, it’s a little fattening. Yes, it’s falling into hangover food category. But my gosh, it’s delicious. In a small frying pan over a medium heat, fry your pancetta until the colour changes and it begins to crisp up. Remove from heat and place in a bowl, with kitchen towel underneath to mop up excess grease. Grate the cheese onto a plate. In a separate pot, add the macaroni, cover with boiling water and bring to the boil over a medium heat. Cook as per the pack instructions, however, remove from heat 2 minutes before cooking time is out. Drain pasta and set aside. In a separate non stick saucepan, melt the butter over a low heat. Once melted, remove from heat and whisk in the flour until you form a paste. Once paste is formed, return to heat, add around 100ml milk and whisk constantly to avoid any lumps forming. Add the remaining milk. Turn up the heat to medium and continue constantly whisking the sauce to prevent lumps forming. Bring sauce to the boil. Cook out for around 5 minutes, until the sauce has thickened. Add in 100g of grated cheese to the sauce and continue to whisk until you have a smooth cheese sauce. Add in the pancetta and stir to mix. Then, pour in the drained pasta and mix until fully covered. 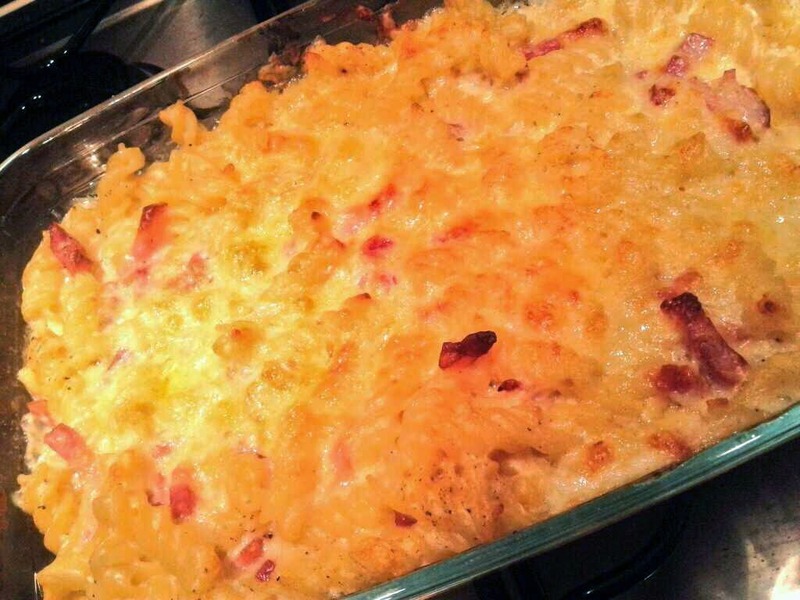 Pour your macaroni, sauce and pancetta into an oven proof dish and sprinkle with the remaining 50g grated cheese. Then, bake in the oven for 20 minutes until bubbling. If you’d like a really crispy topping, change the oven setting to grill and grill on high for 2-3 minutes. Serve immediately with crusty bread and salad. Why not try a 3 cheese lasagne? Add in parmesan to the sauce and try grilling mozzarella on the top. Portions can easily be scaled up and cooked if you have a big enough dish – just freeze the leftovers when cooled and defrost before use. Why not add in chopped leeks to the sauce? Just soften in a pan with butter for 5 minutes, then stir into the sauce. A great way to add hidden vegetables! Looking for more easy midweek meals? Why not try my Oven Baked Cod with Chorizo.